Taiwanese smartphone vendor HTC is yet to launch its first, and probably only, flagship smartphone of 2018. We know that the company has decided to launch fewer phones this year to trim down its losses and focus its R&D efforts on a small number of premium and mid-range devices. 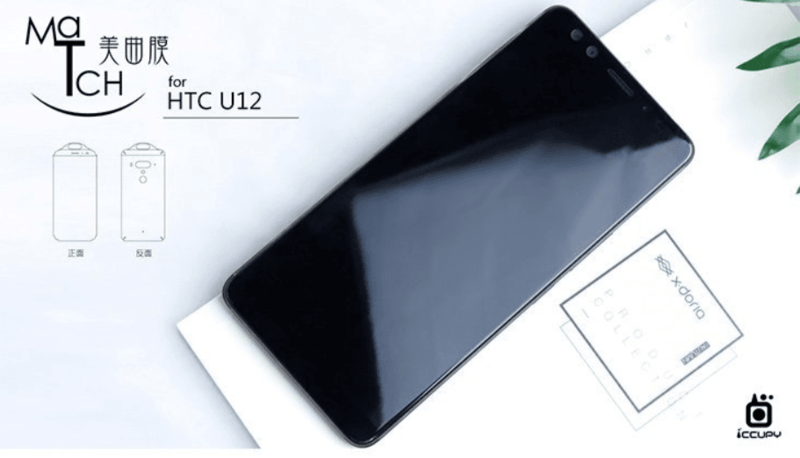 Now HTC U12 Plus screen protectors have surfaced in Taiwan, shedding light on the phone’s design. According to VentureBeat contributor Evan Blass, the upcoming flagship would be called HTC U12 Plus, and there would be no HTC U12. The phone is code-named Imagine, according to Blass. 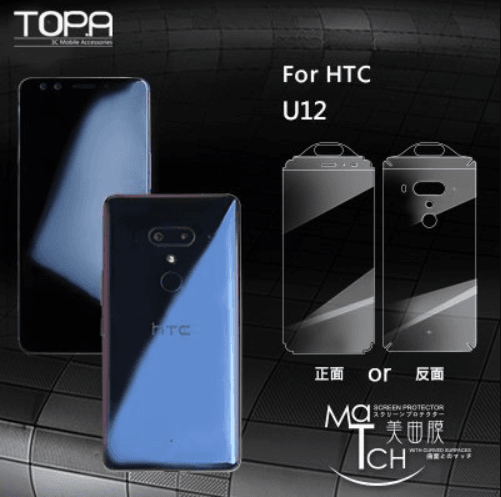 Taiwanese accessories maker Topa-3C has posted pictures of HTC U12 Plus screen protectors along with renders of the handset. The device looks similar to the leaked images that surfaced a few days ago. The rear panel appears to be slightly curved and is made out of the glass to facilitate wireless charging. It sports a horizontally-aligned dual camera system on the back. Below the camera module is the dual-LED flash. The fingerprint sensor is located right below the LED flash, while HTC logo sits in the center. The presence of the rear fingerprint reader suggests that it won’t feature the in-display fingerprint sensor. The HTC U12 Plus screen protectors show that the phone would not have a top cutout on the front. If it happens, HTC will be one of those rare Android vendors that are in no rush to copy the iPhone X notch. The device sports two selfie cameras. It has a full-screen display with an 18:9 aspect ratio similar to HTC’s mid-range Desire 12, but Topa-3C does not mention the display dimensions. 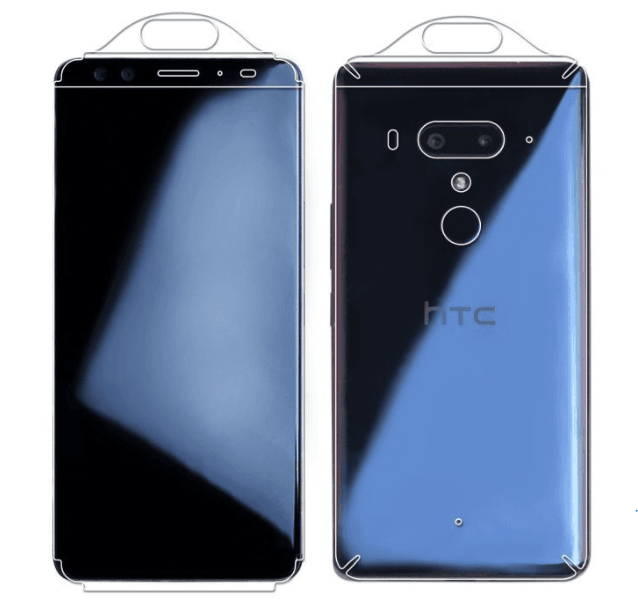 The HTC U12 Plus screen protectors are on sale for TWD 599 (USD 20). The HTC U12 Plus is rumored to have a glass and metal design, where the front and back glass panels are supported by a metal frame in the middle. HTC recently previewed the U12 Plus at a 5G event in Taiwan. The phone showcased at the event had a fully bezel-less display. It was running Qualcomm’s Snapdragon 845 SoC and the X20 LTE modem, which achieved a peak download speed of 810Mbps in the demo. According to Evan Blass, the HTC U12 Plus would launch in late April or early May. Another Twitter tipster LlabTooFeR, who has made accurate predictions about HTC products in the past, says the handset would be unveiled by the end of April. LlabTooFeR added that it would come with a facial recognition feature that would allow users to unlock the handset by looking at it. The presence of the rear-mounted fingerprint scanner suggests the Face Unlock feature would not be highly secure. The HTC U12 Plus is said to feature Qualcomm’s Snapdragon 845 chipset, 6GB RAM, and up to 256GB of internal storage. According to LlabTooFeR, it would have a giant 5.99-inch Quad HD+ display with slim bezels. The phone would pack a 3,420mAh battery with fast charging and wireless charging support. On the software front, it would run Android Oreo with HTC’s custom Sense UI on top. It would support Google’s Project Treble, which allows smartphone vendors to roll out software updates in a more timely fashion. The phone is expected to retain its predecessor’s Edge Sense technology that lets you to launch apps and perform certain actions by squeezing the frame of the device. It would have two 8-megapixel cameras on the front. The rear camera setup would consist of a 16-megapixel and a 12MP sensor. Other features include an IP68 rating for water-resistance. The device would be available in both single-SIM and dual-SIM variants depending on the market. The U12 Plus will likely be HTC’s last attempt to revive its struggling smartphone business. HTC was a dominant player in the smartphone market just a few years ago. But it has lost much of the ground to Samsung, Huawei, Xiaomi, Oppo, Vivo, and OnePlus. HTC’s flagship smartphones are often praised by critics, but they don’t sell in large quantities. The company has sold part of its smartphone business to Google for $1.1 billion. It also recently laid off employees in the United States. The U12 Plus will face intense competition upon launch. Samsung’s Galaxy S9 and S9 Plus are arguably the best and most powerful Android smartphones released this year so far. Huawei has just launched the P20 and P20 Pro that have claimed the title of the world’s best smartphone cameras. LG Electronics is gearing up to launch LG G7 ThinQ with AI features in the next few weeks. OnePlus is also set to introduce its OnePlus 6 soon.